Technical Material Corp. sealed transformer. 13 vac C.T. 2kv insulation. NSN: 6120-00-774-6497. General Radio transformer. Four individual 13v @ 15 amp (very conservative!) winding can be run in series or parallel if needed. 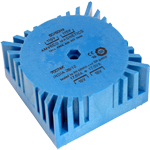 If run in series, 136 vac would be required to obtain full 13v out. 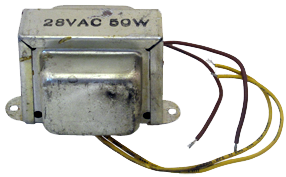 By using a 0-140v variac, one could vary the primary up or down. Bottom (opposite terminals) has 1/4-20 threaded sockets. Tranex transformer. Primary: 120vac terminals 1 and 3. Secondary: 15 vac terminals 4 and 5, 2 amps. Used. 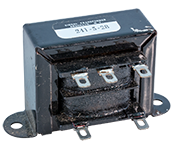 Single 17 vct secondary transformer. Power transformer. 4 tap, 420 Hz. NSN: 5950-00-755-4734. Transformer. Hermetically sealed, terminals. 1500v test. 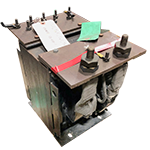 Regional Manufacturing transformer. PC mount. Triple secondary has variable rating, depending on loads. 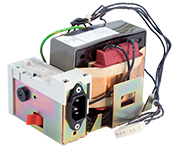 Manufacturer's ranges are listed based on 110 vac input. DUAL Primary can vary however from 90-130 vac and 180-260 vac. Secondary tracks accordingly. PC mount frame is 1-1/2" high x 2-1/4" x 1-7/8". 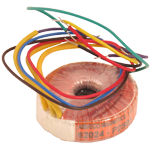 MCI transformer. Open frame, solder lugs, 3/16" push-on terminals. Abbot open frame transformer. PC pins out bottom. NSN: 5950-01-032-8338. Harris transformer. Harris P/N: 472-1070-000. ADC transformer. Hermetically sealed, ultra-statically shielded. Terminals & posts on bottom. 5950-00-807-7849. 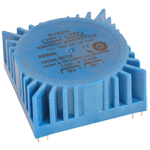 Single Primary of 115 volt 50/60 hertz. Two secondaries, one is 24 volt center tapped at 25 milliamps, the other is 22 volt 25 milliamp. Transformer. NSN: 5950-00-442-2024. QSE transformer. Spades on leads. Signal Transformer PC mount transformer. 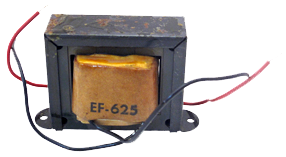 56 va.
Jingshi open frame transformer. Dual winding. PC mount. 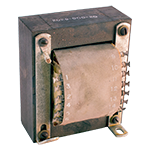 UTC transformer. Hermetically sealed. P/N: 72-0847-000. 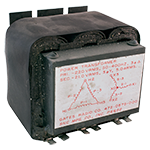 General Dynamics aviation power transformer. 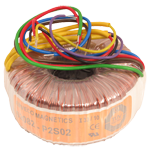 115v, 60 Hz to 22v, 227 ma CT. 5 wire loop terminals. Alt P/N's: TF4SX03YY, 6569, 5189357002. Signal Transformer open frame transformer. 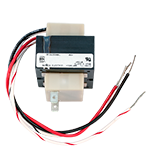 Signal power transformer. 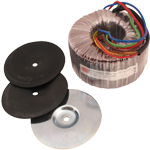 115v input, 20vct @ 5 amps. 2500v hi-pot. Solder-quick connect lugs. 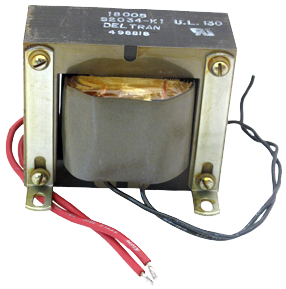 Deltran transformer. 20 vac, 10A. 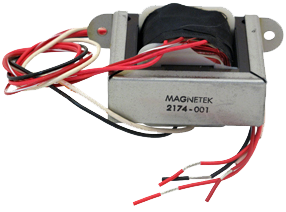 Magnetek transformer. 20vct, 1A, 1500v insulation. Transformer. Marked: 28v AC, 50 watts. Fully loaded output is actually 25v @1.75 amps. 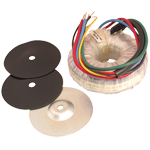 Two 117v 50/60Hz International Primaries; Two secondaries 15v, 3.2amp, 95VA. 3.9"DIA x 1.5"H 2.2lbs. UL & CSA recognized/certified. 10" Color coded leads. Class A 105°C. Primaries must be connected in series or parallel. 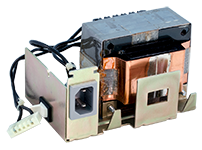 Two 117v 50/60Hz International Primaries; Two secondaries 18v, 3.9amp, 140VA. 3.9"DIA x 1.9"H 3lbs. UL & CSA recognized/certified. 10" Color coded leads. Class A 105°C. Primaries must be connected in series or parallel. Two 117v 50/60Hz International Primaries; Two secondaries 15v, 10amp, 300VA. 4.6"DIA x 2.6"H 5.7lbs. UL & CSA recognized/certified. 10" Color coded leads. Class A 105°C. Primaries must be connected in series or parallel. Two 117v 50/60Hz International Primaries; Two secondaries 24v, 13amp, 625VA. 5.5"DIA x 3.2"H 9.5lbs. UL & CSA recognized/certified. 10" Color coded leads. Class A 105°C. Primaries must be connected in series or parallel. 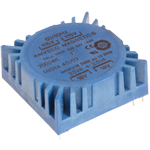 Vishay Medical power transformer. Primary: 120/240v. 120v: Terminals 1&3; Line 1. Terminals 2&4; Line2. 240v: strap 2-3; Line 1&4. Secondary: 27 vac @ 25 amps. 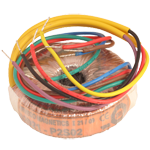 12 AWG secondary. Spade QC terminals. Stancor transformer. 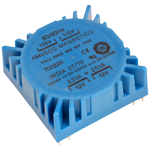 115/250vAC to 24V @ 0.5 Amps/ 12v @ 1 Amp. 200v hi-pot. Low profile PC mount. 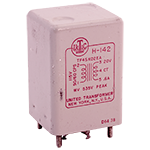 2" x 2-1/2" x 1"
Triad miniature power transformer. 117v to 24v c.t. @ 85 mA. 50/60 Hz. 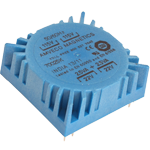 1.375"D x 2.062" x 1.187"H.
Triad filament transformer. 115/230v to 24v c.t. @ 1 amp RMS. 50/60 Hz. 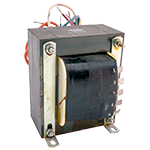 2"W x 3.31" x 1.937"H.
Hytronics power transformer. 120vAC to 24vAC @ 300ma. Through hole mount. 1-7/16" x 1"W x 1-3/16"H. New old stock. UTC hermetically sealed transformer. 115v to 16.5v/74v @ 4.5a/10.5ma RMS. 3 phase. Delta. 60 Hz. 2" x 4" x 4". NSN: 5950-00-419-0174. Stancor dual power transformer. 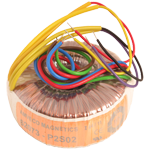 117vAC to 12/24vAC @ 8/4 amps or variable 11.7-29.2v according to primary tap. 50/60-400Hz. 7 lead. 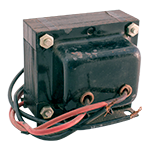 4-1/4" x 3-1/8" x 3-3/4"H.
Honeywell HVAC power transformer. Primary: 120v, 50/60 Hz. Secondary leads: 24v. 39va transformer. 4x4 plate mounting. Thordarson power transformer. Primary: 115/230v, 50/60 Hz. Secondary: 26.4v @ 1.7/1.35a. Hermetically sealed. Electrostatically shielded. Turret terminals. NSN: 5950-00-645-3854. 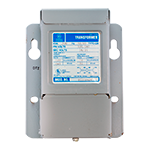 Honeywell/Tradeline HVAC universal circuit breaker transformer. Primary: 120/208/240v. Secondary: 24 vac @ 75 amps. 50/60 Hz. Built in circuit breaker. Foot mount on conduit/panel mount. 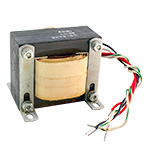 SNC 50-400 Hz transformer. Primary: 220v, 50-400 Hz, 3 phase Delta. Secondary: 21.0v RMS, 3 phase Wye. 5 amps RMS. Mounting centers 1-1/8" x 3-3/8". Made for Gates. Lambda transformer. Primary: 115v AC Black-White. 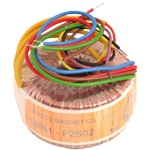 Secondaries: 20v CT @ 10 amps Red-Red, White-Yellow, 21v @ 2 amps Green-Green. Brown - no connection. Mounts vertically or horizontally. 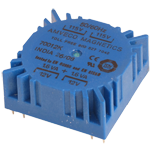 Made for Lambda power supply. Tele-Signal Corp. transformer. 47-63 Hz. 2 primaries: 88/110/120/130/220/240/260. Raise / lower secondary by changing primary taps. Secondary: 20.8v @ 3.3 amps. Hermetically sealed. Fork terminals. 3-1/2" x 3" x 3-11/16". 2-1/8" x 2-5/8" mounting centers. Coil Specialists transformer. Electrostatically shielded (white / grey). Primary: White / Black 115v AC @ 60 Hz. Secondaries: Red: 27v @ 2 amp, White / Green: 22v @ 1 amp. 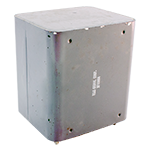 2-5/8" x 3" x 2-1/2"H.
Tranex transformer. Primary: 110/115/120/125v. Secondaries: Red/White-Red: 32v c.t. 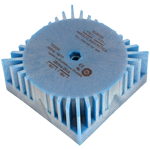 @ 3 amp, Blue/White-Blue: 24v c.t. @ 4 amp, Orange: 8v @ 10 amp. 3-3/4" x 4" x 4-1/2". 10 lbs. Transformer. 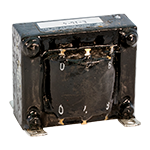 Primary (Black): 115v AC. Secondary (Red): 24v @ 0.75 amps. Circa 1960. 3-3/8" x 3-1/2" x 3-1/4". Power transformer. Primary 1,2: 115v AC, 3,4: 115v AC (115/230). 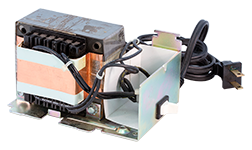 Secondaries: 5,6: 120v @ 0.2 amp; 9-10: 7v @ 0.5 amp; 11-12: 20v @ 3 amp; 13,14: 20v @ 3 amp; 15-16: 9v @ 1 amp. 3-7/16" x 3" x 4-1/4". Weighs 5.7 lbs. UTC Power Transformer. Type H-142. 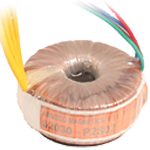 Hermetically sealed, transistor supply transformer. Primary: 115v, 50/60 Hz. Secondary: 20v c.t., 0.6 amps. Milspec: MIL-T-27-A. Transformer assembly. Made for Lexmark. (Also 528PB56). 115v AC input @ 48 - 90 Hz. 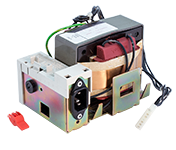 Includes switch, 1.25 amp fuse and socket for standard machine cord. Output to 7 position molex connector. 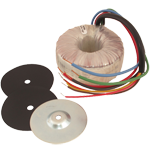 Solid copper electrostatic shield on outside of EI core to reduce typical 60 Hz interference on equipment. Made in Italy. Large quantity in stock. Power Transformer. Made for Lexmark. 115v input @ 50/60 Hz. Includes switch and cord. Output to 5 pin molex connector. 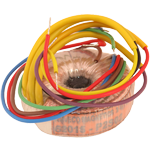 Solid copper electrostatic shield on outside of EI core to reduce typical 60 Hz interference on equipment. Large quantity in stock. Power Transformer. Made for Lexmark. 115v input @ 50/60 Hz. Includes switch and 2 pin AC plug which accepts standard machine cord (3 blade). This transformer will NOT be grounded through this connector. Transformer assembly. Made for Lexmark. (Also 528PB56). 115v AC input @ 48 - 90 Hz. NOTE: Switch was damaged during shipment. 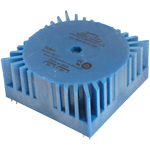 1.25 amp fuse and socket for standard machine cord. Output to 7 position molex connector. 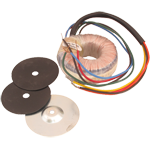 Solid copper electrostatic shield on outside of EI core to reduce typical 60 Hz interference on equipment. Made in Italy. NOTE: Available as we find them in stock. Basler transformer. 115v black & black stripe, red & red stripe. 1/4" spade terminals on output. 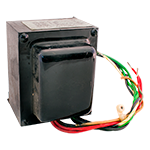 Magnetek SPA replacement transformer. Mounts via frame holes on 1.70" centers. 1/4" spade connectors. 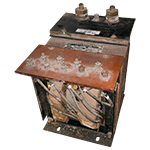 General Electric power transformer. Type QB. 100vA. UL listed. 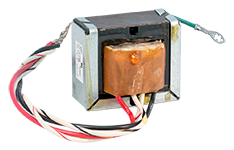 General Electric for Continental Electronics filament transformer. 6 kva. Spare for Continental 420. Used.